AS Malawi gears up to go to what many are calling the closest electoral race in its history, a new report entitled: “Malawi- Political Participation and Democracy,” has pointed to the missed opportunity for electoral reforms in the country. It states that the First Past The Post (FPTP) electoral system does not appear to be serving Malawi well. And ‘losers’ have ended up being crowned ‘winners’ in general elections. Currently Malawi’s electoral rules states that any person vying for political office is deemed the winner based on a simple majority.In essence, one can be a winner of an election without a mandate, as was the case in 1994 with former president Muluzi, who received only 47% of the vote. Ten years later this trend was repeated by late Bingu wa Mutharika, who garnered only 36% of the vote, yet still went on to be president, (although in 2009 Mutharika had 66% of the vote). In essence 64% of electorates rejected him, but because of the FPTP system, he ended up being at the helm of government.“The people of Malawi spoke up in 2006, during the constitutional conference, and decided that an overhaul of its electoral systems was needed. Almost seven years and two elections later, their wishes have not come to pass. Priority must now be placed on reforms and whoever ends up at the helm after May 20th elections, must commit to fulfilling these aspirations and focus on meaningful reform of the electoral system so that good governance and democracy can be consolidated,” said Ozias Tungwarara, manager in the Africa Regional Office of the Open Society Foundation.Participants at the constitutional conference had stated specifically that there has to be a 50 plus one majority for any candidate to be declared winner. This meant that if any candidate could not amass the required more 50% of the votes then a second round of balloting would be held. This recommendation was never been implemented, and was ignored by most politicians because it served their interests. The report also warns of the lack of public confidence in the Malawi Electoral Commission, due to the dominance of the executive, which controls the appointments and dismissals of the Commissioners. MEC’s track record of managing elections is also highlighted, whereby irregularities and logistical problems continue to undermine its credibility. The debate for an overhaul of the voters’ roll remains unresolved, which could magnify the current perception that the MEC is unable to provide a level political playing field for opposition candidates. The report calls for all candidates to focus on calling for the creation of a new voters’ roll as a priority for future elections in Malawi. It also asks the MEC to work closely with the National Registration Bureau in its future projections on registration and confirmation of the voters’ roll, once reforms have been enacted. The report also raises concern over the politics of ethnicity and regionalism, which it states are glaring realities in Malawi. As far back as 1994, the three dominant parties: AFORD; MCP and UDF have retained sizable and consistent margins in North, Central and Southern areas of the country, respectively. And it calls for a code of conduct established by law for political parties, which should be enforced by the MEC. The 323 page study also praises Malawi’s democratic credentials, and urges law makers to focus on far reaching reforms and harmonize laws that relate to local government and local government elections, the constitutional amendment act of 2012 and the national Decentralization Policy, with a view to creating a clear legal and policy framework for local governance in Malawi. The study authored by Wiseman Chirwa, focuses on nine thematic areas: Malawi’s constitutional framework; equal citizenship; policy processes; elections; political parties; the legislature; local government; traditional authorities; and development assistance. It makes recommendations for urgent reforms in all thematic areas, and states that another opportunity for demonstration of political will for political transformation in Malawi should not be lost after the general elections in May. The studies on Political Participation and Democracy have been conducted and launched in Benin, DRC, Ghana, Lesotho, Mozambique, Senegal, Sierra Leone Swaziland, South Africa and Zambia. Kenya is soon to be published. This forms part of a series of reports that also assesses governance in the Justice Sector and Public Service Delivery in Education in the respective countries. AfriMAP, the Africa Governance Monitoring and Advocacy Project, is an initiative of the Open Society Foundations, and works with national civil society organizations to conduct systematic audits of government performance in three areas: the justice sector and the rule of law; political participation and democracy; and effective delivery of public services. The project also assesses the African Peer Review Mechanism and roles of Public broadcasters in Africa. OSISA, the Open Society Initiative for Southern Africa (OSISA) is a regional Foundation that is part of a global network of the Open Society Foundations. Established in 1997, and based in Johannesburg, OSISA’s vision is the realization of a vibrant Southern African society in which people, free from material and other deprivation, understand their rights and responsibilities and participate democratically in all spheres of life. In pursuit of this vision, OSISA’s mission is to initiate and undertake advocacy work (and support initiatives by others) that seek to establish the ideals of open society in the region. MHRRC, Malawi Human Rights Resource Centre works with civil society organizations to effectively support the developing democracy in the country. MHRRC contributes towards the consolidation of channels of free expression and other rights for the citizens by working with and building the capacity of NGOs and CSOs working on human rights. 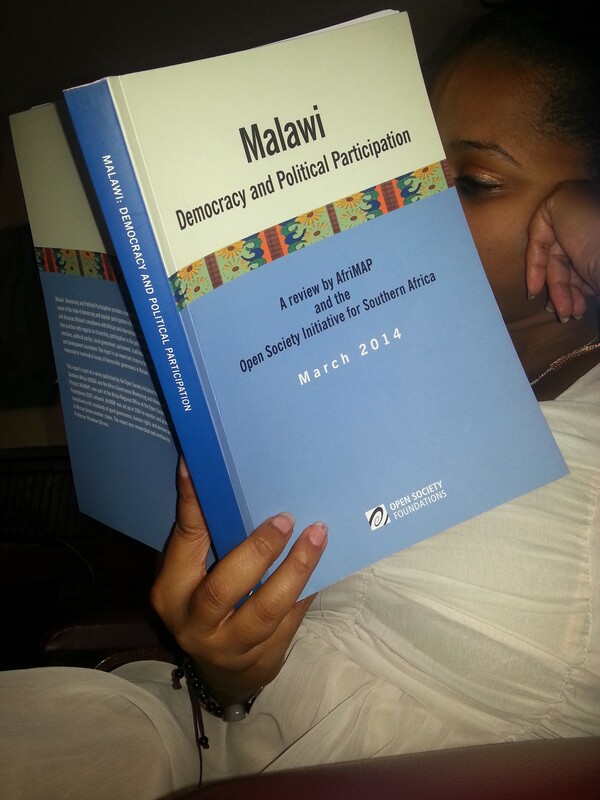 Please note that this report was officially launched in Malawi on 27 March, 2014.